REPLICA 17TH CENTURY JOINED CHEST, handmade from kiln dried English oak and designed as a radiator cover, with four front panels and five top panels carved in quatrefoil guilloche pattern. These have been pierced with over one thousand apertures for air circulation! The frame members have hand-cut scratch mouldings and the top rails carved with lunettes. The Latin inscription carved in relief translates to: ‘If the truth you want, these numbers turn upside down’ which, if you do just that with the date, reads 1991, which is when this piece of furniture was made. 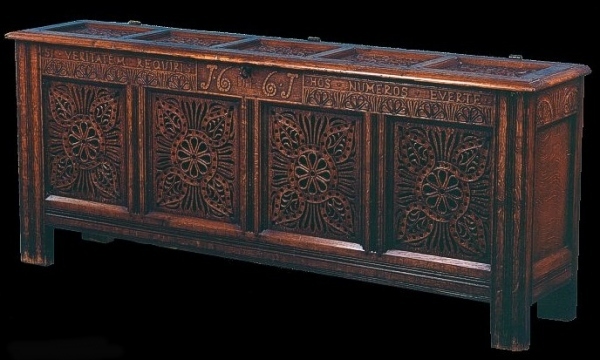 Yet the method of construction and style of decoration is typical of an original chest of 1661 (the Stuart period) which may well have come from Somerset, England.